A typical ceramic is created from a slurry of ceramic particles which is cast, shaped or coated into its required form followed by removal of the liquid and then high-temperature firing to "sinter" the particles together. On this page the focus is on technical ceramics produced from solvent slurries via coating, drying and firing as three separate steps. The inorganic particles on their own cannot be coated/dried satisfactorily and so have some sort of polymer dispersant to give a controlled particle dispersion and some "green strength" to the dried coating so that it can be handled before firing. The central challenge is to have a dispersion with the highest possible % solids which, on drying, forms a compact solid with minimum internal stresses and zero cracking. During the final firing process, the low level of polymer is volatilised with minimal further shrinkage to produce a strong, homogeneous end product. It is obvious that there are contradictions inherent in such a process. A large amount of polymer will make it easy to have a robust intermediate form, but that will create internal stresses when it volatilises. A higher % solids will minimise stresses during drying but a bad formulation will give unacceptably high viscosities or viscoelasticity and/or thixotropy which make coating very difficult.. The solvent system must give good dispersions and should evaporate in a controlled manner so that stresses during drying are minimised. For example, if the ceramic system "crashes out" of dispersion early during drying, then there will be many voids in the system and high stresses at the end of the drying process. Some general rules of how to use HSP in such processes have been known from the early days of HSP because for some time Hansen worked in the paint industry and one key heuristic he developed early on has stood the test of time: Choose a solvent system that is borderline compatible with the particle and with the dispersing polymer. A common mistake was to choose a solvent that was especially compatible with the polymer. The problem is that the polymer might be so happy in the solvent that it removes itself from the particle. Alternatively, a solvent that was especially compatible with the particle might mean that the particles themselves are adequately dispersed, but the polymer shell is coiled up on itself so there is no network of polymers formed on drying so the film being formed is too incoherent. TaC coatings were deposited on graphite substrates via wet powder forming and sintering to potentially achieve both a highly reliable and low-cost process. Non-aqueous solvent mixtures of TaC slurries were optimized through characterization of raw materials and a novel design guide based on Hansen solubility parameters. The optimized TaC slurries enabled the formation of high-quality TaC powder compact films with ultrahigh powder packing densities of ≥70% (ca. 85% at maximum), which contributed to prevent defect formation in the TaC coatings after sintering. 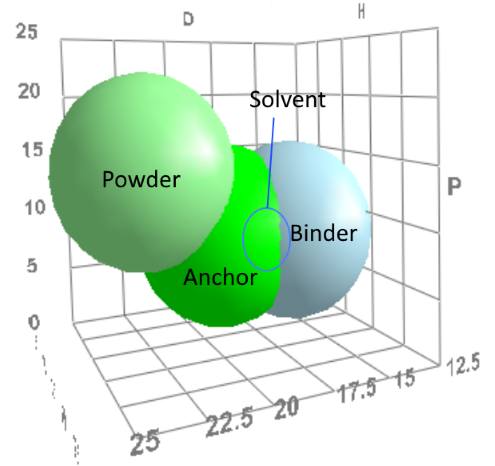 As shown in the figure at the top, based on a Fig 1 in the paper, the team were able to characterise the particles (powder), the polymer (binder) and as an extra degree of sophistication, an anchor component between the polymer and the particle. In each case, the authors used HSPiP to determine the respective spheres of the components and could find that the optimal HSP for the solvent was at a sweet spot among the three spheres. Having determined the required HSP of the solvent, the next stage was to find the perfect solvent. Here there are multiple practical issues such as cost, safety etc. Their formulations were typically 15% solids with good coating rheology, something that was not possible with bad solvent blends which gave, for example, depletion flocculation by removing the anchor. But there is also a balance required with respect to evaporation rates. A fast-evaporating solvent gives high productivity, but a high drying rate creates high stresses in the compacting particles. Slow-evaporating solvents are good for producing low stresses but are impractical. So the authors created a smart solvent blend of fast and slow solvents so the initial drying could be rapid but at the critical stage where the particles are becoming close-packed, the slower-evaporating solvent allowed the stresses to relax. Of course the HSP of the two solvents had to be chosen so that the changes of HSP as the faster-evaporating solvent left the system steered the formulation to the right part of solubility space. At the start, the blend had to ensure a low-enough viscosity (i.e. little self-clustering of particles) to avoid, say, thixotropy which makes the coating process difficult. At the end the risk of removing the anchor would be minimal so the HSP should be closer to the polymer so that it could be nicely relaxed with minimum strain in the system. The solvent blends required depended on the coating process: the needs for a dip-coated system are different from those of a spray-coated system. The authors clearly show why the up-front work needed to measure the HSP of the individual components pays off in terms of high-quality final ceramics. The paper clearly shows the difference between poor (many cracks!) and good coatings. And the final high packing densities (70-85%) meant good quality films after firing. There are so many compromises in any ceramic system that the chances of getting the right balance via trial and error are very small. Using HSP to make rational decisions about many issues, including the solvent blend, they could achieve super-high quality TaC ceramics on graphite which could, in turn, be used for forming other sophisticated ceramics - the details are in the paper.